Is the 4Runner equipped with KDSS? Is the 4Runner a Limited model? All of the precise engineering and design structure of our Rock Sliders, but constructed from pure American .188 DOM tubing! 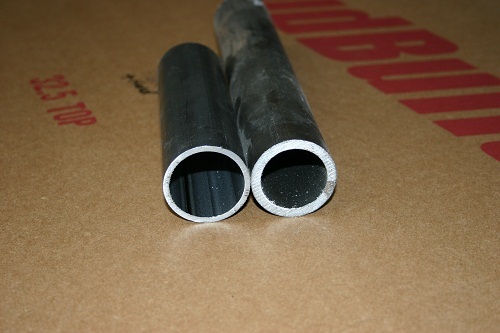 Ladies and Gentlemen, that is 3/16" steel, cold rolled into 2" and 1.75" tubes for the main and outer tubes. These will NOT dent, bend, bow, etc. Built for the hardest trails and the toughest drivers. Comes with a lifetime warranty against bending. Warranty against bending does NOT apply to the fill plates. 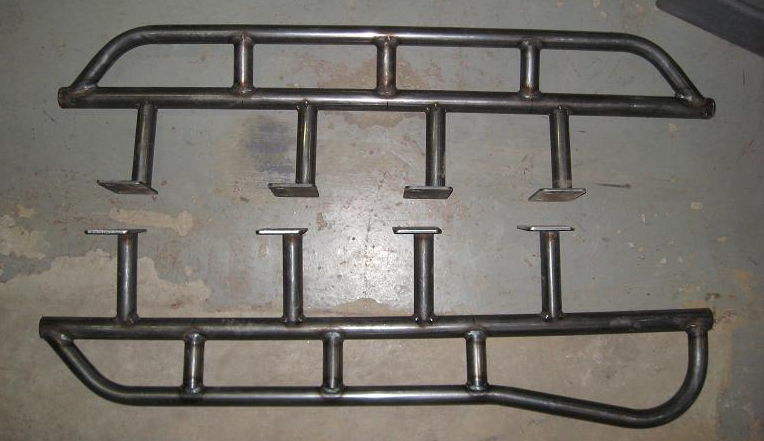 The second image shows the optional "partial" fill plating available. 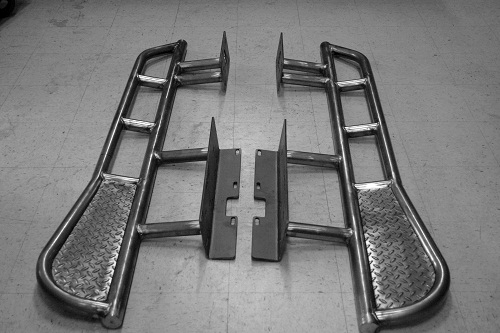 The "legs" in this picture are for the 2010 4 Runner. The third image shows the optional "full" fill plating available. The "legs" in this picture are also for the 2010 4 Runner. .188 Drawn Over Mandel (DOM) - 134 pounds (61kg) per pair (2). Add 24 pounds for Full Fill Dimple Die Tread Plates. Add 28 pounds for Full Fill Smooth and Diamond Tread Plates. Absolute strength for hard-core, leave nothing back, rock crawling. Fills the rear third of the slider, between the main and outer tubes, with 1/8" (3.175mm) American steel. This option is typically chosen in conjunction with our "kicker" option. 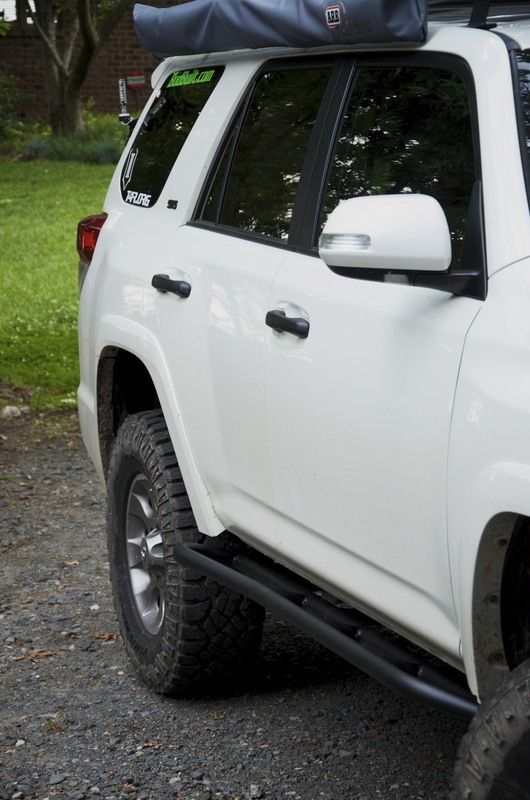 Offers a wonderful step surface to better access the 4Runner's roof or optional rack mounted accessories. Fill the entire slider between the main and outer tubes with 1/8" (3.175mm) American steel. This option works extremely well with both straight and "kicker" sliders. 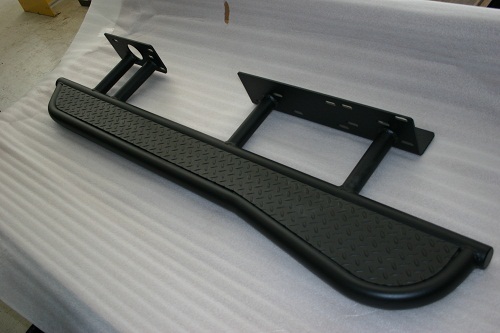 Offers driver and passengers a superior step surface for cab entry and exit. A fill plate design for both partial and full fill plates. Smooth is simple, classic and refined. A fill plate design for both partial and full fill plates. Diamond plate offers a superior traction surface with the classic feel of strength and authority. A fill plate design for both partial and full fill plates. Dimple Die Up is our modern take on diamond plate. Evenly spaced 2" laser cut holes are individually pressed to giving dimension and purpose. Once orientated up, form joins function, and the pressed edges offer a high traction step surface. A fill plate design for both partial and full fill plates. 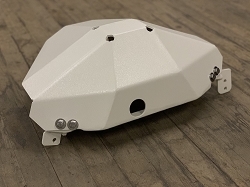 Dimple Die Down offers modern, aggressive styling. Evenly spaced 2" laser cut holes are individually pressed to giving dimension and purpose. Once orientated down, this fill plate offers a unique, race inspired form.